Dan Drayton has raced in every round of the European Junior Cup (EJC) this season. Taking in some of the most famous tracks in Europe, including Misano, Assen and Imola, Dan has pitted himself against some of the best young riders in the world. And while he may not have had the success he had hoped for on the track, it’s clear that Dan is enjoying his time in the World Superbike (WSBK) paddock. “Being in and around the WSBK paddock, among the world class riders, and having the opportunity to compete in the EJC at the best tracks, has been unbelievable,” said Dan after his last race at Misano, a track he particularly enjoyed. Dan finished in 17th at Misano, in a race that was dominated by an incident involving championship leader, Javi Orellana. The Spaniard crashed out after contact with Emanuele Pusceddu with just three corners to go when victory would have sealed the title with two races remaining. Pusceddu had started the race in second place in the championship. The next race in the EJC is in September when the riders will head to Jerez for the penultimate race of the season. From there, the riders will head up to Magny-Cours in France for the final race of the season. 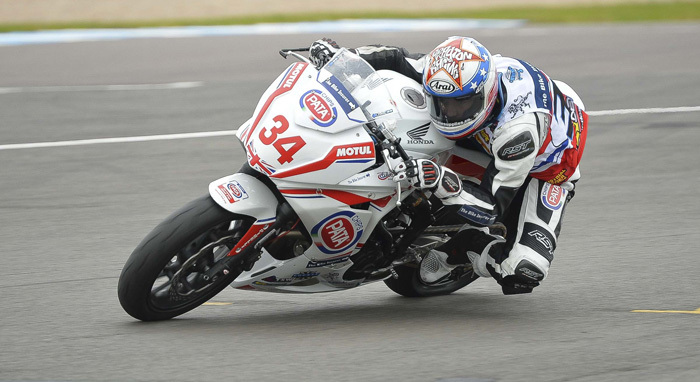 Before the start of the season, Dan had only raced at Jerez and Donington of the tracks in the EJC calendar. Adjusting to new tracks week in and week out is one thing that Dan flags up as challenging for anyone new to the championship. With the exception of learning the tracks, Dan doesn’t have too much to complain about when it comes to life on the road. “The travelling is tiring but not difficult and I’ve been to some great tracks and some great places already this season, so there are no complaints and I can’t wait to get to Jerez in September.